Heat pan on low heat and add oil. When heated, add cinnamon, star anise, cardamoms, cloves, fennel and cumin. To this, add the chopped onions, garlic, ginger and bay leaves. Fry till the onions wilt and add the drained rice and salt and stir till all the rice are well coated. This will take about 2-3 mins. Tranfer rice mixture to your usual cooking vessel or rice cooker. Add water/stock and cook rice like normal. 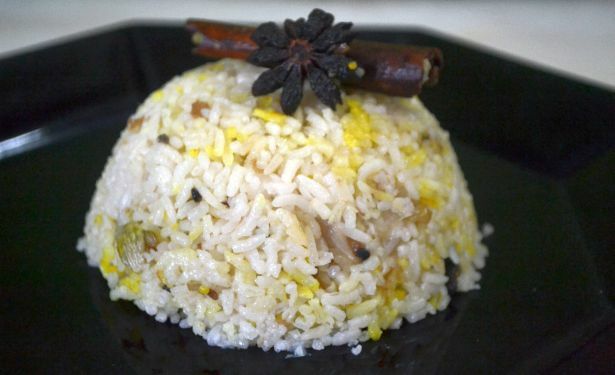 When the rice is cooked and all the water/stock has evaporated, sprinkle a little bit of turmeric powder on the top and let the rice rest. Serve it on its own or garnish as desired. Note: Sometimes the quantity of water used in cooking rice will depend on the variety of rice used. You may have to vary the use of liquid content and this will lead to some funny, frustrating and disastrous outcomes, so take it in your stride till you perfect it. You tried, that´s what matters and with practice, nothing will be a challenge.